Leading off today: Niskayuna school district officials are investigating allegations that students yelled racial slurs Tuesday at players during a girls varsity soccer game against Schenectady. A statement on the district's website said such behavior is a violation of "everything that we stand for as a school district." Schenectady AD Steve Boynton confirmed that Schenectady soccer players were targeted with racist comments during a lopsided loss at Niskayuna. "That did occur from a small portion of the Niskayuna student body," Boynton said. "(The Schenectady players) handled themselves like young ladies." Boynton said he and Niskayuna counterpart Larry Gillooley interviewed Schenectady players about what happened. The players listed the comments they heard and detailed where they heard them, The Daily Gazette reported. Players and parents from both schools have been interviewed and said they heard the racist comments as well, the paper reported. Niskayuna Superintendent Cosimo Tangorra Jr. said students found to have uttered the slurs will face discipline under the district's code of conduct. "I was disappointed," Tangorra said. "We work very hard to create a welcoming community ... to stamp out this type of behavior. So, we have some work to do." Boys soccer: Sophomore Eric Shippee scored in the second overtime for Monroe-Woodbury in a 1-0 win over Washingtonville in action between state-ranked Section 9 teams. 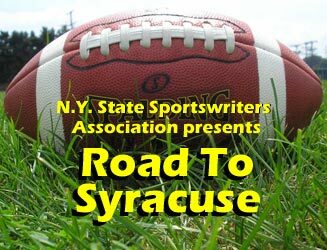 Monroe-Woodbury is ranked third in Class AA and Washingtonville 10th. Dylan McDermott made three saves for the shutout as M-W improved to 13-0. • The boys game between Laurens and Edmeston was suspended due to darkness with the score 1-1 in the second overtime -- and not without complications. Officials put 15 minutes on the clock for each overtime period instead of the proper 10. After the error was noted, it was agreed the league playoff game would resume Thursday with 2:08 to play, followed by penalty kicks if necessary. Logan Williams forced the overtime with a goal for Edmeston with six minutes left in regulation. Girls soccer: Senior Delaney Rutan scored twice, including the winner in double overtime as Cincinnatus, ranked third in the state in Class D, defeated DeRuyter 2-1 to improve to 15-0. Rutan leads the Lions with 34 goals this season. She registered her 100th career goal last month. LaSalle forfeits two games: LaSalle Institute has forfeited two Section 2 football wins after self-reporting the use of an ineligible player. The games were non-league wins by scores of 43-14 vs. Ravena-Coeymans-Selkirk on Aug. 31 and 49-6 over Ichabod Crane on Sept. 28. The forfeits drop LaSalle's record to 1-5. A school news release referred to the issue as being a paperwork oversight related to a transfer student who enrolled in April. LaSalle plays at Amsterdam on Friday. The winner will earn the Capital Division's No. 4 seed for the sectional tournament. No need for this: A huge football game scheduled for Friday in California has attracted so much interest that there's even a betting line for it, USA Today reported. A Costa Rica-based online sportsbook established Santa Ana Mater Dei as a 9½-point favorite over Bellflower St. John Bosco. The teams are ranked first and second, respectively, by USA Today. The same sportsbook is also taking wagers on four other high school games this weekend. As legalized gambling has advanced following a recent Supreme Court decision, the National Federation of State High School Associations has come out in opposition of any gambling on its events. Legal books in New Jersey, Delaware, Mississippi and West Virginia have all declined to take bets on high school sports. Dubious on several counts: With four high schools but no artificial turf fields, the Greece Central School District is probably overdue for some of the amenities available at any number on other districts across Section 5 and the state. How the school board thinks it is going to go about catching up in that department reminds me of the expression about how two wrongs don't make a right. The board voted 9-0 on Tuesday to approve a proposal for a $107 million capital project with multiple components and put it to a public vote. It includes the addition of turf fields and lighted fields to all four high schools as part of $24.8 million in athletic upgrades. The Democrat and Chronicle reported district documents say the work would be done with no additional cost to taxpayers since $92 million would be covered by state aid and the remainder would come from existing capital reserves. While the wording may technically be true, it's not exactly accurate. The state aid comes from a pot of money acquired from taxpayers, including those who reside in Greece. In addition, the district's capital reserves fund is comprised largely of money raised through local property taxes. And then there's the issue of the vote. The date for balloting was set for Dec. 4, by which time snowbird citizens will have left for winter homes in the south or west. If the weather is poor that day -- a distinct possibility in a rust belt community -- elderly voters are more likely than other demographics to stay home. In short, the board is dong everything it can to be sure the voters most likely to object might not get to the polling place to cast votes in opposition. There's no reason whatsoever that the vote couldn't be conducted in May at the same time that budget is voted upon.